Below are the results for the 67th Annual Green Eyeshade Awards. Our judges select the best from each main category, then select one winner of the Green Eyeshade. Judges’ Comment: In a competition awash in journalistic might, the Chattanooga Times Free Press’ massive series “The Poverty Puzzle” snares the brass ring. An exhaustive whirlwind of the absolute — every imaginable statistic — and the abstract (cold fear), it grabs the reader by the lapels and makes her look. Brisk storytelling, vigorous sourcing, even embedded video and audio give us the faces of despair and the heartbeat of hope and so many emotional data bits in between: The ideas that worked and those that did not. The reluctant activist who found anew his faith, and the reporter who found her way back home. 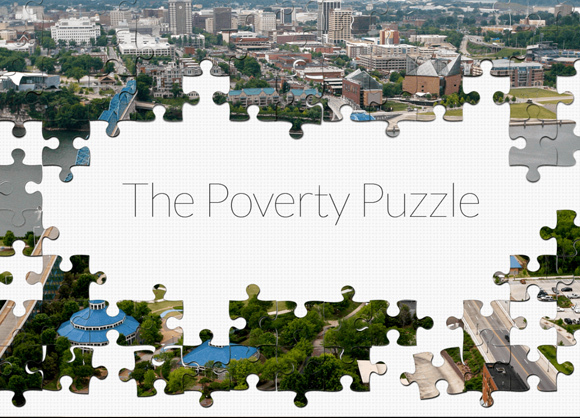 Complete with research links and crisp visuals, “The Poverty Puzzle” engages, informs, inspires. It is a magnificent effort surely with lasting results, exemplifying the work the Green Eyeshade Award exists to honor. Third Place: Teaching Tolerance – Robert Reece, Heather O’Connell, Adrienne van der Valk, Segregation Forever? Second Place: Tampa Bay Times – Eve Edelheit, Would you know when it’s time to go?